The two Koreas on Friday agreed to hold military and Red Cross talks this month and open a liaison office in the North Korean border city of Kaesong, according to a joint statement released by the South’s Ministry of Unification. The statement came as a result of the high-level meeting held the same day at the truce village of Panmunjeom at the border. The talks aimed to bring about the swift implementation of agreements reached at the summit on April 27. Both sides will continue to cooperate in drawing up necessary measures for setting up a Kaesong liaison office, the statement read. They agreed to hold general-level military talks on June 14 to address issues surrounding border tension and the initiation of defense ministerial talks. It will be closely followed by a meeting for sports exchange on June 18 at Panmunjeom and an inter-Korean Red Cross meeting on June 22 at the North’s Kumgangsan. The Red Cross meetings have served as a platform to work out details for the reunion of families divided by the 1950-53 Korean War, which is scheduled to fall on the occasion of the Aug. 15 Liberation Day this year. Separate talks for joint research to restore now-defunct cross-border railways and roads along the western and eastern coasts, reforestation projects to recover the North’s devastated woodlands, and a North Korean art troupe’s performance in the South will be also scheduled through further exchange of relevant documents. 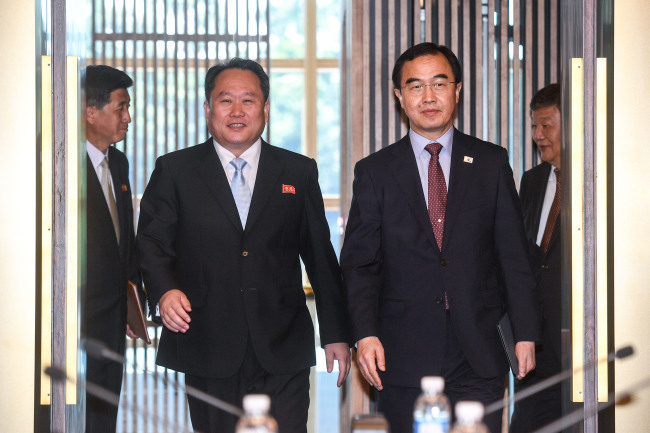 Friday’s high-level meeting, which kicked off at 10 a.m., was attended by South Korean Unification Minister Cho Myoung-gyon, who led a five-member delegation, including Vice Transport Minister Kim Jeong-ryeol and Vice Culture Minster Roh Tae-kang. The North dispatched a delegation headed by Ri Son-gwon, chairman of the Committee for the Peaceful Reunification of the Country. Members included Vice Railroad Minister Kim Yun-hyok and Vice Sports Minister Won Kil-u. 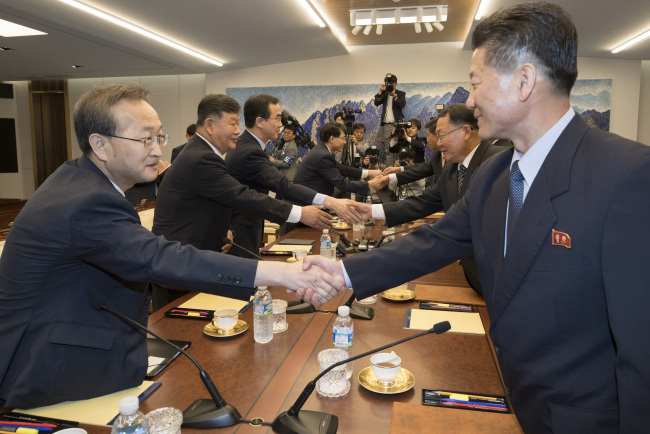 During the roughly hourlong morning session of the meeting, South Korea had reiterated the need to open a liaison office in the North Korean border city of Kaesong as the first step in implementing the Panmunjeom Declaration adopted in April. The North shared the view and said the channel needs to be opened “as soon as possible,” according to a ministry official. In the Panmunjeom Declaration, the two sides reaffirmed the goal of complete denuclearization of the Korean Peninsula, agreed to halt all hostile acts against each other, and pledged to revive joint events and projects that had been halted in recent years. Analysts noted that the main focus of the meeting would be the revival of economic cooperation, with North Korean leader Kim Jong-un in April announcing the completion of the “byungjin policy” of simultaneous pursuit of both nuclear power and economic growth. Kim said he instead would shift full attention to achieving the country’s economic prosperity. Reforestation projects to restore the North’s barren woodlands and modernize railroads are expected to lay out the foundation for more active economic cooperation in the future. At the moment, layers of international sanctions imposed on the North -- which aim to block the flow of hard currency into its nuclear program -- prevent both sides from actively pursuing several projects. The high-level talks were originally scheduled for May 16, but the North abruptly canceled at the last minute, taking issue with South Korea-US joint military drills. At the second inter-Korean summit last week, the leaders of the two Koreas agreed to hold high-level talks on June 1 to map out detailed steps to implement the Panmunjeom Declaration, and agreed to work together to make a North Korea-US summit happen. The meeting comes amid a flurry of diplomacy for a potential summit between the US and North Korea, which will likely take place in Singapore on June 12 to tackle denuclearization of the Korean Peninsula. Ahead of Friday’s meeting, Cho and Ri both stressed “trust and respect” between the two Koreas. “We can think of North and South Korea as the wheels that move the cart forward,” Ri said, adding that the driving force behind the cart is mutual “trust and respect. “I believe that there is no problem that we cannot solve together if we deal with it based on trust, respect and understanding of the other side, which is the basic mindset that South and North Korea both agree to,” Cho said.